The weekend’s main attention was on the Virgin Money London Marathon and the IAAF World Relays, reports on which can be found here. Other notable action included the following. There was a double for New Zealand’s Daniel Wallis and his wife Hillory Wallis (née Davis), who retained their titles but this time they returned to the city as newlyweds. Daniel won the 10-mile event in 50:23, followed by Scotland’s Andrew Douglas in 50:41 and Michael Crawley third in 52:23. Hillory enjoyed a minute victory in 63:42, with Mia Lutsch runner-up in 64:42 and Victoria Riddell third in 66:33. Daniel said: “I found the race a lot harder than I did last year but I wanted to do my best to try and win again. “I really wanted to be able to relax and run around at a marathon pace but Andrew, who came in second, just wouldn’t let me. Hillory added: “I felt a little bit of pressure going into the event as a previous winner. “I expected to be able to handle the course a lot better this time but it was just as hard. It’s a tough course to run and the hills are not easy to tackle. “Last year was so fun and I enjoyed it just as much this year, but it’s nice to cross the finish line first as a Wallis. 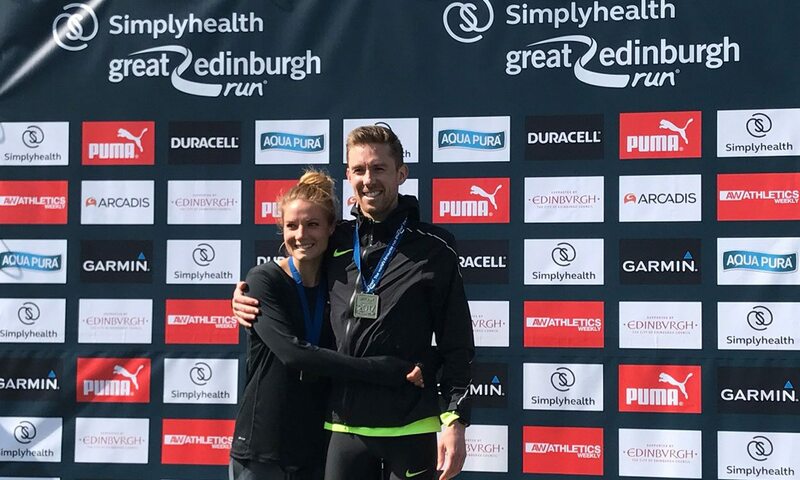 There was also a five-mile option and those races were won by Barry Paterson in a time of 28:53 and Rachel Newstead in 32:51. Scott Beattie, who was 47th for Britain in the World Cross Country Championships, was an emphatic winner of men’s race in 15:00. Former track international, Stacey Smith, smashed Justina Heslop’s year-old course record by 27 seconds to win the women’s race with a time of 16:15. Les Venmore’s report will appear in this week’s AW magazine. The marathons were won by Paul Burton (2:49:01) and Emma Loughlin (3:06:24). Lewis Gamble-Thompson (71:45) and Alexandra Potter (90:57) won the accompanying half-marathon and Joseph Monk (33:16) and Lynda Rawlinson (44:45) the 10km. Gilbert Grundy in 32:05 and W40 competitor Pauline Powell in 37:54 were clear winners of the event. Jim Cole won the men’s race in 72:22, while 2:32:40 marathoner Emma Stepto won the women’s race in 80:27. World junior champion Callum Wilkinson won the men’s 5000m walk in 19:57.8, with runner-up Cameron Corbishley second in a PB 20:10.7. Max Burgin, who last year set a UK under-15 800m record of 1:53.1, improved his PB to 1:52.08. He is still aged only 14 until later this month and his mark improves Jakob Ingebrigtsen’s 1:52.60 European age-best. Nick Miller came within centimetres of his British record 77.55m as he threw 77.51m to go fourth in the 2017 world lists and bag him a World Championships qualifier. Paralympic champion Aled Davies threw a discus personal best of 54.85m to also improve the F42 world record. In the shot put he threw 17.19m. Ama Pipi continued her improvement as she won the 200m in a PB and world qualifier of 22.95. She became the 31st Briton to break the 23-second barrier. Nicholas Percy won the discus with a season’s best of 62.38m. Nethaneel Mitchell-Blake won in 20.15 in his first 200m of the season. In her 400m debut and on her return after injury, Ashleigh Nelson ran 53.29. Jamaine Coleman scored a winning double at 1500m and steeplechase – the latter in a PB time of 8:42.82. National cross country champion Jessica Judd ran a time of 8:55.76 in the 3000m to be just outside her best time. Close behind her, National under-15 champion Kristian Imroth set a PB 8:57.07.